Controversial in its own day, Eakins’ painting still appears shocking and disturbing, even more than one hundred years after its creation. 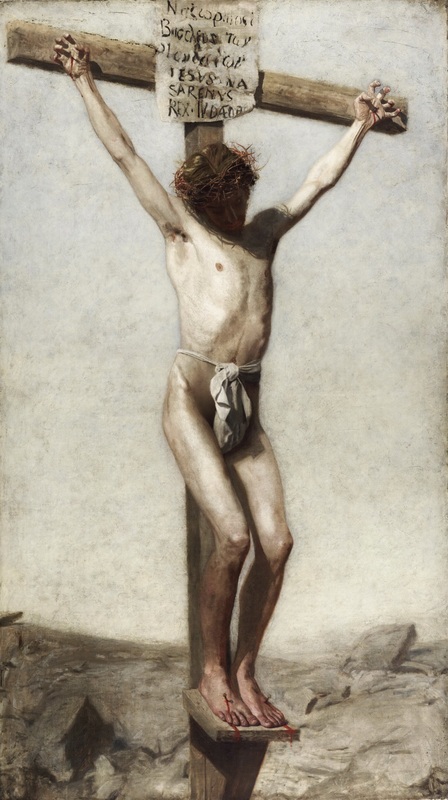 Dedicated to realism in art and suspicious of organized religion, Eakins wanted to paint a Jesus for a modern American audience. Emphasizing Jesus’ physical body and eliminating traditional signs of divinity (such as a halo), Eakins showed Jesus’ head bowed and shrouded in shadows, his claw-like hands clenched in pain and bright red drips of blood running down his feet. There is nothing here of a kingly or triumphant Jesus. Instead, this is a man scorned and betrayed, who seems to have just cried out the desperate words “My God, why have you forsaken me?” Uncomfortably realistic in its depiction of Jesus, the painting drives home the utterly scandalous nature of the cross. How do you react to Eakins’ depiction of Jesus on the cross? What thoughts and feelings does it evoke? Spend some time meditating on why you might react the way you do. What might your reactions reveal about the way you see Christ? Contemplate the weakness and vulnerability of God on the cross. How does the cross challenge your ideas of strength? How does the cross convey what love is? Think about a time when you might have felt like crying out, “My God, my God, why have you forsaken me?” Christ was forsaken so that we would never be left alone again. Spend a few minutes meditating on this truth and confessing to God your own weakness and vulnerability. Loving Christ, who suffered, died, and rose again, grant me the faith to take up my own cross today and follow you. Put to death my pride and selfishness that I might reflect the gentle and loving way of Jesus. In the name of the Father, Son, and Holy Spirit, who love me with perfect love. Amen.